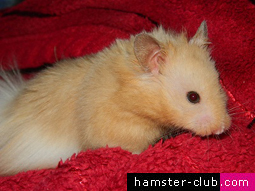 Hamster Club :: Why are hamsters solitary? The fact that most hamsters are solitary is one of the most important things for a hamster owner to know. The main reason why hamsters are solitary is that naturally they are like that, and there is nothing that one can do to change this, because it is in their nature to be solitary. They always fend to themselves, are territorial and do not like sharing the cage.... or food! Only dwarf hamsters may live in groups if brought together from a young age, and sometimes, they are not always sociable and prefer to live alone, one per cage question, is simple. A female Syrian hamster comes in heat (i.e she accepts mating with a male hamster), every four days, thus on the fourth day of every cycle, the female hamster would be able to mate with the male hamster. One important thing must be taken into consideration. This is that Syrian hamster mating must always take place in a neutral territory i.e neither in his and nor in her cage. The mating must be done in a new cage, area or box : ) (the box should be left open and never left unattended of course!). After the mating is successful, it is important to separate the hamsters and put them back in their separate cages. Good planning must be taken before one mates his/her hamsters, since unplanned hamster mating is never recommended and since most hamsters are solitary (especially Syrian hamsters), after four weeks of age, these would need a cage each�so care must be taken.